The Sirens Review Squad is made up of Sirens volunteers, who submit short reviews of books (often fantasy literature by women authors) they’ve read and enjoyed. If you’re interested in sending us a review to run on the blog, please email us! 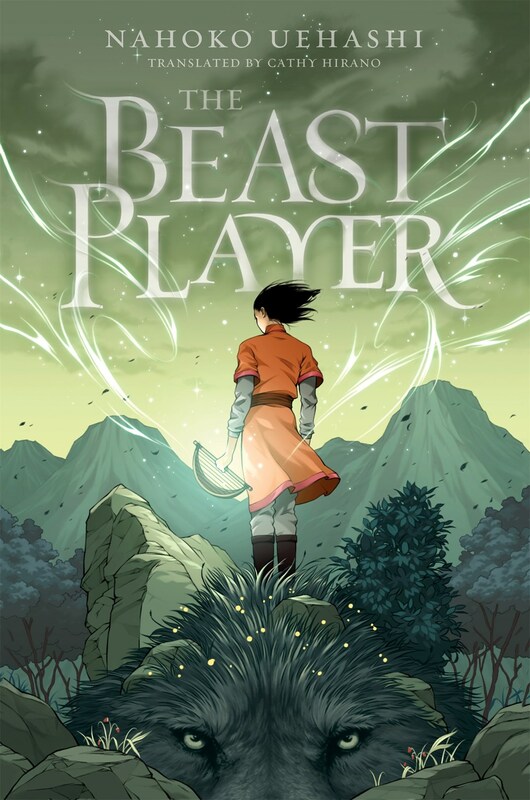 Today, we welcome a review from Casey Blair on Nahoko Uehashi’s The Beast Player. After reading Nahoko Uehashi’s Moribito: Guardian of the Spirit, I was thrilled to learn another of her books has been translated by Cathy Hirano and has now just come out this spring in YA. I dove into The Beast Player and immediately fell in love. As a bookseller, I’m often asked by teens and parents for YA book recommendations that don’t center romance and physical violence, both of which have become a common feature in the category. And while I love overthrow-the-oppressors-and-also-find-true-love stories, this book is doing something different, and it’s doing it beautifully. In The Beast Player, Elin is a quiet, thoughtful girl who idolizes her mother, an accomplished beast doctor to the Toda, battle serpents used by the nation’s military. When the Toda mysteriously die, her mother is sentenced to death; while Elin escapes and finds refuge with an avuncular beekeeper, her journey is just beginning. As her own beast doctoring skills develop, she’s unwillingly thrust into a world of politics. The Beast Player is a coming-of-age story, but it is also a meditation on, in particular, what it means to be free. Elin is a girl who watches the world around her, collects information, and considers it deeply on her own. A girl who asks questions and doesn’t accept other people’s judgments on right or wrong. A girl who will never, can never, fit in anywhere—but also a girl who is more concerned with finding a place where she can be her full self. Elin’s parents are of two different heritages, and neither family wants to claim her as theirs, only to control her. And Elin? She wants nothing more than to be able to care for the majestic, magical creatures in her world, regardless of what it means in the political sphere. But the consequences of Elin caring for magical creatures aren’t simple. There are people who want to use them, and use her to control them: and if they can control her, and her them, has she cared for them truly? Or has she created a different kind of chain around their necks? Women who go their own way, dragon battles, found family, political upheaval, and friendship with magical creatures? Yes, I mean, obviously sign me up. But these are not what make the book great. In any sort of meditation on freedom and choice, engaging with cultural context and power dynamics is critical. As in Moribito, Uehashi’s attention to anthropological detail is incredibly thorough, and so is her understanding and depiction of how power disparities manifest. The questions are complex, and Uehashi convincingly makes what might seem simple or low stakes in another story incredibly nuanced and fraught. The Beast Player is also unflinching in its consideration of the role of humans in coexisting with the natural world, the corruptive power of secrets, and the overlap of art and science. But what really strikes me and makes me want to push this book into everyone’s hands is how she handles the commitment to love over fear—because choosing to love can be hard. Through Elin, Uehashi treats this commitment not as a one-time act, but a practice, and that even if we make mistakes along the way, it matters that we try. That we don’t settle for easier answers. As we swim in a political morass of bigotry, reading about people who are trying their absolute best to come together to care for others is so critically important. I finished this quiet book and felt seen, validated, and empowered. It is the kind of story that gives you a kernel of strength to hold onto and carry with you through the hard days, and those are the stories I value most. It’s not a perfect book: it ends abruptly, and some transitions and emotional beats feel jarring. However, I suspect this may have to do with its translation from Japanese, and the passages that read like narrative blips to me might feel more natural in the context of their original language. The translator did an amazing job, and ultimately, I’m just excited that it’s available for an English-reading audience! The Beast Player’s greatest strength is its heart: it builds slowly, and as all the pieces come inevitably together, it unfurls into a powerful story that has made itself a quiet, cozy, intensely devoted place in my heart forever. Casey Blair is an indie bookseller who writes speculative fiction novels for adults and teens, and her weekly serial fantasy novel Tea Princess Chronicles is available online for free. She is a graduate of Vassar College and of the Viable Paradise residential science fiction and fantasy writing workshop. After teaching English in rural Japan for two years, she relocated to the Seattle area. She is prone to spontaneous dancing, exploring ancient cities around the world, wandering and adventuring through forests, spoiling cats terribly, and drinking inordinate amounts of tea late into the night.